I purchased the book, The 52 Lists Project for my 43rd birthday. 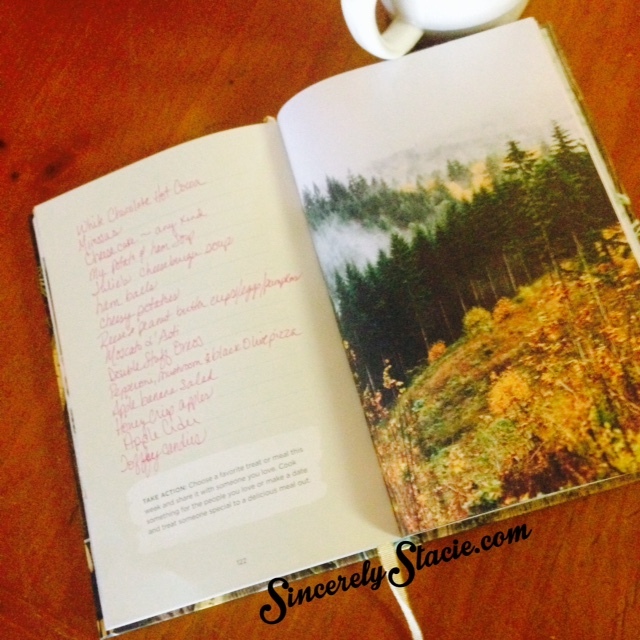 The book focuses on weekly journaling based on lists. I love making lists and thought this sounded like a great way to remember a year. I plan to complete a list every week for this next year. Even though the journal begins in Winter with Week 1, I started my list during Fall with Week 40. So, I’ll be moving through the book a bit backwards, which is hard for my organized brain, but I didn’t want to be writing about winter topics in spring or summer in winter. I’ll be sharing my lists here, hopefully, one a week. To see my previous lists, click on the tag 52 Lists Project at the bottom of this post. It’s my hope that by sharing my lists, you’ll get to know me a bit better and maybe be reminded of something that brings you joy! Some weeks the topics may be too personal to share completely on here, but I’ll at least tell you about the lists and some of the things on it. Since I started this the week I turned 43, I am a bit behind schedule to get these lists all done by the time I turn 44, but I’ll try and catch up. Sometimes I have to think about the things I want to add to my lists for a few days! 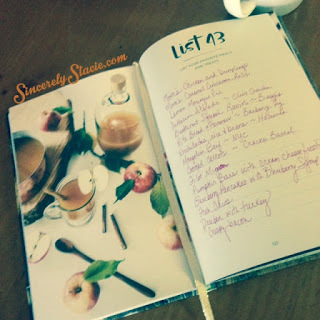 This week’s list is My Favorite Meals and Treats. A lot of them came really easy to me and it only took me a day to fill up both pages, with an extra late entry. I love all the photos in the book as well. They are so vivid and fit perfectly with the categories. At the end of each list, the author offers an idea to expand on that week’s list. This week’s action plan is to choose a favorite treat or meal this week and share it with someone you love. Cook something for the people you love or make a date and treat someone special to a delicious meal out. While making this list, I made Apple Banana Salad which is a favorite from my childhood and now a favorite of our kids as well. But, this list has reminded me of many other dishes I want to make soon! If you are interested in learning more about THE 52 LISTS PROJECT, click HERE to be taken to the author’s website. You can also purchase the book, HERE. Every one of these meals and treats would bring a smile to my face. I could live for the rest of my life on these foods. This list made me hungry! I love so many of the things including pumpkin bars and cheesecake!